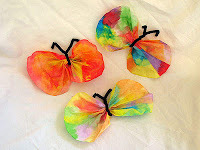 a note from apple seeds: Cute summer art project to do at home! Cute summer art project to do at home! Here is a cute summer art project to do with your kids at home. - Give your artist the coffee filter and paint/markers or crayons. Let them decorate it and make sure they get both sides.